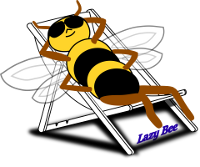 All the scripts described below can be read in full on the Lazy Bee Scripts web site (click on the titles). However, all the scripts on this site are copyrighted. 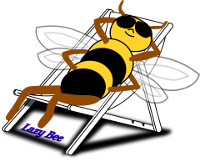 They may not be printed, quoted or performed without the permission of Lazy Bee Scripts. Click on the "Price" links for details of the script prices and licensing arrangements. Roles Minimum Male roles = 1. Minimum Female roles = 1. Minimum total with doubling = 2. Minimum total without doubling = 2. No chorus. Style Short comedy sketch. Minimal domestic setting. Contains marital disharmony. Synopsis 'She' tries to explain to her husband that she has an attentive admirer. Price Please click on the Price Link to find the cost. Click here to read the script or Click here for more details. Roles Minimum Male roles = 1. Minimum Female roles = 1. Minimum total with doubling = 3. Minimum total without doubling = 3. No chorus. Whilst the characters are nominally gendered, they are, when all's said and done, two pigeons and a cat! Style Short sketch. The author suggests it could be performed as a radio play so that the anthropomorphic twist is not revealed until the right moment, but it could be staged. No set or props required, though if it is staged, costumes would be a good idea! Synopsis A pair of homing pigeons encounter difficulties finding their way home. Roles Minimum Male roles = 1. Minimum Female roles = 0. Minimum total with doubling = 4. Minimum total without doubling = 4. No chorus. The characters - a schoolmaster and three boys - are written male, but need not be. They also need not be played by actors of appropriate age - it is, after all, a send-up. Style Short comedy sketch. No set and no props - which is really the point of the sketch! It is, of course, Health and Safety gone mad. Roles Minimum Male roles = 4. Minimum Female roles = 0. Minimum total with doubling = 4. Minimum total without doubling = 4. No chorus. Synopsis The troops manning a dug-out in the front line receive a visit from the Brigade Health and Safety inspector! Roles Minimum Male roles = 2. Minimum Female roles = 0. Minimum total with doubling = 2. Minimum total without doubling = 2. No chorus. Style A short comedy sketch with no set required. Synopsis Ben and Jerry wonder where Hefty went after running away from the circus and whether he joined Nellie. Roles Minimum Male roles = 1. Minimum Female roles = 0. Minimum total with doubling = 1. Minimum total without doubling = 1. No chorus. Set in modern times, but rather a Woosterish central character! Style Monologue - a short black comedy, with no requirement for set or props. Contains limited swearing and dishonourable motives! Synopsis A dissolute young man tells a tale of woe, recounting how he tried to 'hurry along' his inheritance from his rich Great Uncle Silas. Trouble is, having a new companion gives the old boy a new lease of life, and he drives his grandnephew to distraction living it to the full. Roles Minimum Male roles = 6. Minimum Female roles = 9. Minimum total with doubling = 6. Minimum total without doubling = 17. No chorus. Cast size can be reduced to six with doubling and costume changes! Style A short one act, large-cast comedy. Synopsis Various hilarious characters populate a fly-on-the-wall look at a speed dating evening. Gerald decides that a detailed account of his recent cricket match is the best way to woo a partner. Bryan delves into his recent toenail extraction to engage Beth before appropriately asking if she would like to eat. Whilst Alix is eager to find a man to test her martial arts skills on whether he wants her to or not. Finalist - 2018 Downtown Urban Arts Festival (DUAF), NYC. Style A comedy duologue sketch with a simple set. Synopsis Having ended his relationship with Phyllis, John is having withdrawal difficulties. Much to Phyllis’ initial annoyance and incredulity, John enlists her help with his problem. Awards Click here to see the awards won by (productions of) this script. Synopsis An old officer comes across his pal in a pub and perceives a problem with his probosis. Roles Minimum Male roles = 3. Minimum Female roles = 2. Minimum total with doubling = 5. Minimum total without doubling = 5. No chorus. Synopsis Henry The Eighth walks amongst his people and is struck by the lewd advances of Anne Boleyn, leading him to split from the Catholic church to obtain his divorce from Katherine of Aragon.